LEWISTON – In October Ben Chin wrote in an internal campaign email about “the revolution” he would like to see happen in Lewiston. The message, written in an upbeat tone to more than a dozen Chin campaign team members, is the latest in a group of emails leaked to Maine Examiner from a Chin campaign insider concerned about the direction of the campaign. 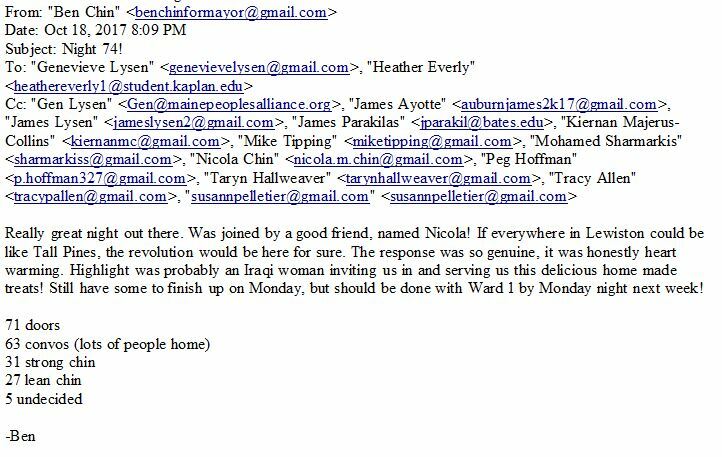 While Chin’s desire for a “revolution” is spelled out in the email, what that “revolution” would look like on the political or policy front is not directly explained in the email. Instead, Chin focuses on the type of transformation needed in Lewiston to bring the revolution about. Ben Chin, candidate for Mayor of Lewiston, Maine. of different income levels suggests that the email shows Chin directly expressing a desire for more low-income housing and greater immigration levels as a way to build a critical mass of voters to bring about the change and “revolution” he desires. While conservative voters have at times been ridiculed for suggesting that some liberal politicians see a path for political success through transforming communities with expansion of low-income housing projects and increased immigration, Chin’s email seems to at least suggest that he sees some viability in the approach. Relevant to Chin’s talk of a revolution is that Chin has previously expressed support for allowing non-citizens to vote in local elections, a policy change he has yet to make a reality in Lewiston or Portland, Maine. It is unclear how Chin could know the household income levels of individual residents of the city of Lewiston. Maine Examiner has provided a screenshot of the leaked email Chin sent about “the revolution” below. Ben Chin’s email written October 18, 2017 to his inner campaign team.